Hot on the heels of Colson Whitehead’s magical realist version on slavery in the antebellum south The Underground Railroad (reviewed here) comes Ben Winter’s alternate history exploring similar issues. Ben Winter’s version of the present is one in which Abe Lincoln was assassinated before the civil war and in the aftermath of that event a compromise was reached in which the Southern states were allowed to maintain slavery. Modern day America still has four slave states (the Hard Four) and has spent the twentieth century as an economic pariah, suffering trade embargoes from Europe but finding alternative markets for its goods in Africa and Asia. The Underground Airlines of the title describes the system in place to help escaped slaves, known in the vernacular as People Under Bond or Peebs, reach the safety of Canada. They are unable to stay even in the free states of the US because of laws which allow Federal Marshalls to recapture and return them. The book opens on Victor, a former slave who managed to escape to the North only to be blackmailed and trained into working for the Marshalls to track down other escaped slaves. But all is not what it seems with his latest job. Like any good noir detective story, what starts as a seemingly simple job, turns out to be part of something much bigger. Winters builds his world meticulously. But what we see in this thought experiment is the inexorable tide of history. People like Martin Luther King Junior, Michael Jackson and James Brown all exist in this world but in very different incarnations. While the majority of the United States is free, life for many of the African American population in the free states is not much better than for some of those in the slave states and is strongly reminiscent of recent events. And the broader hypocrisy of a world living on cheap goods with a blind eye turned to the people used to produce those goods is laid bare. Victor is a detective in the classic noir mode. Damaged, compromised, extremely good at his job and torn between following orders and doing the right thing. He helps and is helped along the way by Martha, a white woman with her own issues to work through. Martha becomes critical in the later part of the novel and is given agency in a way that does not quite gel with the character that is introduced earlier on. 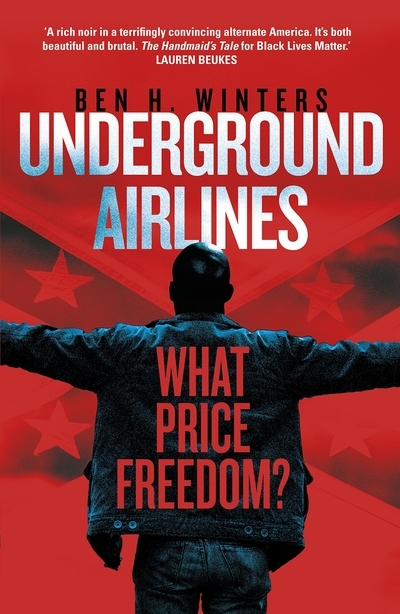 While Underground Airlines shares much of its messaging with recent books and films about slavery it also joins a list of provocative alternate histories such as Fatherland and The Yiddish Policeman’s Union which use crime fiction tropes to explore and expose their worlds. And while the plot takes a slightly more science fiction twist towards the end, there only seems to be a very thin veil between the world we live in and the cracked-mirror world that Winters has created.